Savory Mashed Potato Puffs are sort of little Yorkshire puddings stuffed with mashed potatoes. A really yummy and fun side dish. Great served with a special roast beef or roast pork. Serve them with some roasted veggies as a vegetarian meal too (that’d be my choice!). They’d be great for brunch the next morning as well as dinner or lunch. I’m thinking of making these Savory Mashed Potato Puffs for Thanksgiving dinner. We have a small group this year, so these will be perfect. If you have a large group for Thanksgiving, feel free to double the recipe. It’s nice and easy – just a simple flout batter that puffs up as it bakes around the herbed mashed potato filling. 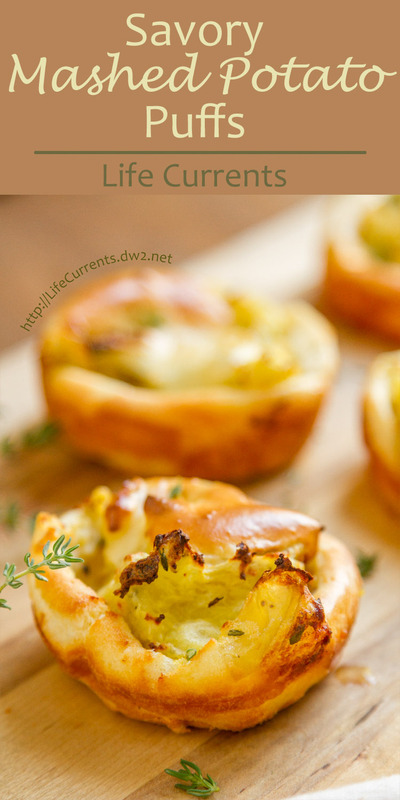 These Savory Mashed Potato Puffs are a great way to use leftover mashed potatoes! Think Thanksgiving or Christmas leftovers. I give basic instructions for making mashed potatoes in the recipe card, but feel free to skip these steps if you’re using leftovers. I like the herbs in the mashed potatoes; they give the dish a nice fresh flavor. If you’re using leftover mashed potatoes, just mix in a couple teaspoons of fresh thyme. Any kind of starchy potatoes will work for this recipe. I like Yukon Golds; they have a nice buttery flavor. Russet potatoes will also work well. I’d avoid the waxy red potatoes for this recipe, though. As for the butter in the bottom of the ramekin, I think that the richness of butter is really a winner here. But, if you’re looking to cut back on saturated fat, oil may be substituted for the butter, and you can cut back to ½ teaspoon of oil per ramekin as well. But, if you’re looking to go full flavor, go ahead, use 1 teaspoon butter per ramekin. It’s just this once, right? Bring a large pot of salted water to a boil. Add the chopped potatoes, and cook until tender when pierced with a fork, about 10-15 minutes. Drain potatoes, and mash with a little milk, butter, salt, and pepper to taste. Stir in the fresh thyme. Set aside. Preheat the oven to 400° F. Place 6 small ramekins on a cookie sheet, and set aside. In the bowl of a food processor, add flour, egg, milk, and a large pinch of salt. Process to make a smooth batter. Place 1 teaspoon of butter in the bottom of each of the ramekins. Place the tray of ramekins in the oven for 2-3 minutes, until the butter is melted and very hot. Working quickly, pour about 1 tablespoon batter into each of the ramekins. Add a heaped tablespoon of mashed potatoes into the center of the batter, and top with another tablespoon of remaining batter in each ramekin. Place in the oven, and bake until puffy and golden brown, about 15-25 minutes. Use an offset spatula to carefully remove the Mashed Potato Puffs from the ramekins, and serve warm. These potato puffs look so good! I would love to try it soon! These potato puffs would be so pretty for Thanksgiving! Much more elegant than mashed potatoes. Wow, yum Debi!! I love everything about these. It’s always handy having recipes that use left over potatoes! I’m sure they’d be delicious with sweet potato too! Those are so pretty! I’m going to save this and make it with the Thanksgiving leftovers! Thanks! These look heavenly! I think they’d be perfect for Thanksgiving. Or I like the idea of using leftover mashed potatoes, so maybe I’ll just make extra then we can have these with the rest of our leftovers the next day! Sarah, I love the idea of making these with sweet potato! What a pretty color they will be. These sound heavenly! Gorgeous pictures and perfect for Thanksgiving! What a classy way to serve mashed potatoes. Love this! I bet you could do these in muffin trays too! how fun! Working for a catering company I get all kinds of leftover foods, mashed potatoes are currently sitting in my fridge, this would be the perfect way to use them up – thanks for the recipe! Also, I love yorkshire puddings but you never see them in the states! These look like the perfect bite-sized appetizers to serve at Thanksgiving! Can’t wait to give it a whirl. Thanks! Sarah, I thought of that too! And They’d be cute done in yorkshire pudding trays too. Thanks! ummmmm YUM!!! These look so pop-able and deeelicious!